Customer Centricity is the promise of AI. It seems to be the holy grail that continues to elude business. Marketing solutions and systems integrators are trying to build technology frameworks for Next Best Action that take real-time consumer context into consideration. They’re still falling short. But what if the only way to truly get to the heart of understanding the customer is to amass a huge amount of data, from different perspectives, different data sets — with the intent to return results that intuitively match the consumer’s expectations at the right time? That is exactly what YROO has set out to do. Nick Qi Zhu is a seasoned software engineer with 17 years of professional experience. He graduated with a Bachelor’s degree in Economics from Shanghai University. He speaks of his father, an economics professor trained in traditional mathematics, and of his grandfather, an electrical engineer who introduced him to his world of radio components and circuitry at a very young age. Nick was interested in computers and remembers learning a language called Logo in first grade. While his degree is in Economics, Nick’s interest emanated from consumer behavior and data. Before founding Yroo.com, Nick cultivated his programming skills in the dot.com boom and became a software engineer. He later completed his Masters degree in Computer Science and began working as an independent software consultant. He later on joined ThoughtWorks as lead consultant for their Canadian practice. In the last 10 years, his passion and specialization focused on distributed computing, language design, machine learning and data mining. At ThoughtWorks, Nick built ad-tracking software for an ad platform to track online ads and analyze, in real time, billions of signals from the network. In addition, he built software for a call centre software vendor, allowing them to optimize call-handling by aggregating social data, voice data and account information, analyzing voice tones for consumer sentiment and surfacing contextual relevance – in an effort to improve customer engagement at the call centre. These projects leveraged big data and machine learning (ML) to help business predict customer behavior and optimize the customer conversion point in the journey. There is an imbalance of information and the consumer continues to do all the work. They also don’t have visibility to make a better buying decision. If a retailer promotes a product for 60% off, what does that mean? Is it discounted from the suggested retail price? And what if you received 60% off yesterday but today it’s 40% off? That’s a price increase of 20% from the day previous. From Nick’s purview, research companies like MarketWatch have noted that the Suggested Retail Price (SRP) is bloated and hence untrustworthy. So what is the baseline? Enterprise retail access to data has, overtime, allowed them to get better at selling the consumer the right product at the right moment. Their arsenal amasses customer demographic information, family composition, disposable income, interests, and online searches, etc. YROO is now running version 3 of its algorithm in production. It’s taken 18 months to get here. Yroo is live in the US aggregating information from 5,000 merchants and platforms, including the F100 enterprise retailers. The model is smart and it can cluster products together so it’s useful for the consumer to get all the information in one place in real time. Within moments, the customer can make a decision of what product to buy and from what retailer. The next algorithm Yroo is tackling is ranking. Since consumers digest limited amounts of information at a time, it’s important to provide information that’s useful for the consumer. For the first time consumer, they are typically served sponsored placements first, and products that may provide the retailer the best margins. YROO set out to change this with the goal of intuitively returning results that match the consumer expectations. With access to other signals including top-selling products, sales ranking from various merchants, and leveraging the neural networks to improve the ranking, Yroo is able to optimize on the buyer behavior. YROO does have some sponsored ads as part of its monetization strategy but for the most part, the results returned are organic. Their promise is to ensure that sponsored ads do NOT push relevant results below the fold, like Amazon. While an overwhelming amount of data comes from Amazon, Nick says that now having a broad access to many merchants helps remove the bias from Amazon’s sheer volume. At the end of the day, the algorithm will represent the mass consumer market vs. the specialized, more niche ones. How are they faring? The last Black Friday event returned double the mobile conversion rate on YROO for one of the largest platforms when compared to their average mobile traffic within the same time period. This validation has also translated into the commissions YROO has been able to garner as a result of its lead generation and conversion performance. 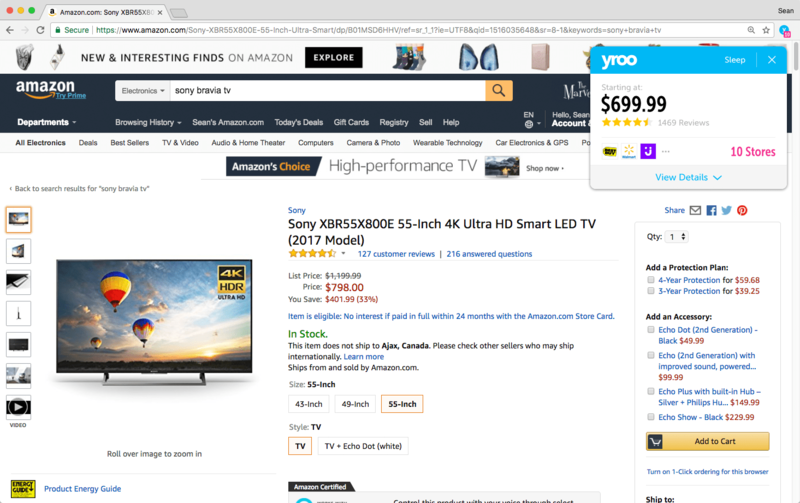 If you happen to be on Amazon searching for that special speaker, what if a small notification popped up on your browser revealing other stores selling that product at the varying prices? 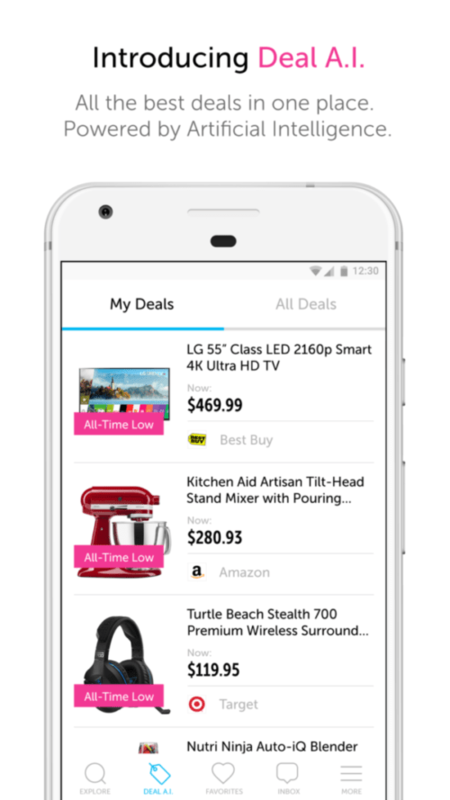 So, no more searching on Google or hopping to other retailers to price-compare. Everything comes to you the minute you are looking for a particular product. That will eliminate the time and effort it previously took to ensure you found the best price. This side by side comparison reduces the consumer search effort and brings the right information directly to you That is powerful! Reflecting on the evolution to really understand the consumer, Nick believes that advertising isn’t going anywhere soon. Brand awareness, through personalization and mass media will continue. However, the online ad market is wrought with many unethical traits from fraud to click-bait, bots, and click farms. It needs to reform or risk losing significant ad dollars. The rise of programmatic was a proverbial shotgun approach that further sank the industry’s reputation. With AI, the data will allow room for less intrusive, more personalized, more intelligent and more value-based messages for the consumer. As AI becomes more common place, and we move further into Deep Neural Nets, Nick states it will make it more difficult to delve into explainable AI. The future of AI also attempts to codify human knowledge. As Nick points out, the challenge is attempting to codify “know-hows,” ie the things you cannot explain but just “know how to do” e.g. riding a bike or walking. This is a moment in time that would be noteworthy where a mathematical equation can truly codify intuitions or actions without real logic. That is the essence of what makes the human brain special. In meeting Nick, I now realize this holy grail of customer centricity is alive an well. Its mythical assumptions have been brought to fruition in YROO. Nick’s experimentations in trying to understand consumer needs and behavior have brought incredible success to this entrepreneur, whose focus and passion in driving towards this goal continue unabated.